This groundbreaking new middle grade series follows DC Comics' most iconic female Super Heroes and Super-Villains . . . as high schoolers. At Super Hero High, the galaxy's most powerful teens nurture their powers and master the fundamentals of what it means to be a hero. I can't begin to tell you how excited I was when this book made it's way into my inbox, so excited that I found myself replying in silly puns about how Super excited I was that this book was in the world (I know you can't stop hearing Elton John sing 'Your Song' can you? Sorry not sorry) and that I was getting the opportunity to dive into this new world. I am happy to announce that my excitement still holds, this book did not disappoint. 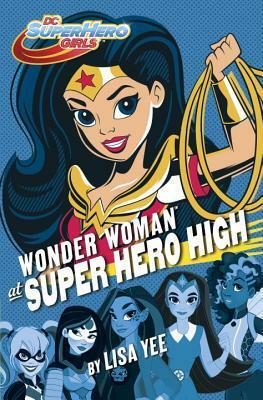 As the title would suggest this particular story revolves around Wonder Woman and her introduction to Super Hero High. Having been essentially isolated while growing up on the idyllic Paradise Island, Wonder Woman longs to see more, learn more, help more, and do more. On her own she applies to the prestigious Super Hero High and is accepted. All the training she has be given during her years on Paradise Island is no match for the world she encounters. A world full of differing opinions, choices, thoughts, abilities, and to top it all of, it's high school! I loved the naiveness that Wonder Woman brings. She's so strong and powerful in all things but her introduction to a world she has never experienced brings a light heartedness to the story. She's so amazed and exuberant about everything around her she just exudes joy and it makes your heart smile. While there are a lot of light moments there is also a lot of suspense and action, as one would expect when it comes to super heroes. There is a mystery to be solved as well as classes to take (such as making super hero costumes, learning flying tricks, solving riddles, and many more) and friends to be made. This is in the end a book about Wonder Woman discovering her true self and learning about friendship. On of my favorite things about this book is that it opens up the typically male dominated dark world of the DCU to a new generation and more importantly in my opinion to girls! I loved getting to meet all the characters in a way we have never really seen them before, (not including Superman) they all have that youthful spirit you expect, the joy children and teens should have. The darkness that we have come to know, and in many cases for DC fans love, isn't in these characters. This series isn't about the super heroes fighting their own demons and the demons of others, it is a series about growing up, making friends, finding your path, and becoming who you are meant to be. This isn't the end all be all for Wonder Woman. When you get to the end of this book it is clear that her journey has not ended, it's only just beginning, but the growth she has through this book is wonderful to see. This is a great read for ANY fan of the DCU. It is not a comic book, this is a middle grade novel so if you aren't typically a comic fan do not let the knowledge that it comes from the DC world to scare you away. I'm overly excited about this book I will admit because I think we need more options like this for young girls. My oldest daughter is extremely interested in Anime, Manga, Comics, Gaming, etc but this is a world that is traditionally 'ruled' over by boys and men so to have a book that she can go to where she can see strong young female super heroes and shows her that she is just as worthy as the male population makes me want to shout about this series to the world. All school libraries should have this on their shelves, it is a book that can be read from anywhere around 9 and up in my opinion, even young high schoolers will find this book enjoyable and worthy. If you have a super hero fan in your house make sure to add this to your home library too and don't be scared that your boys won't like it because it revolves around Wonder Woman, I promise you they will! Lisa Yee was born and raised near Los Angeles. As a kid, she loved reading, opening brand new boxes of cereal (to get the prize), and riding the teacups at Disneyland. Lisa attended Brightwood Elementary School in Monterey Park, California where she once won an award for best decorated cake. However, Lisa cut the ribbon in half because her friend Linda had also worked on the cake, and they had agreed to split any prize they might win. While at Alhambra High School, Lisa was on the debate team and president of the honor society. On occasion, she would ditch class and sneak off to the library. (Okay, so she never quite figured out the juvenile delinquent thing.) At the University of Southern California, she majored in English and Humanities, and she also took a bowling class. Lisa has been an inventor, a hand model, and the associate director of a creative think tank. At Walt Disney World Lisa was a writer/producer and one time, when she was the only short person around, she got to be Mickey Mouse. Lisa has also penned her own newspaper column, written TV and radio commercials, menus that have been read by millions, jingles for waffles, and television specials for Disney. Livesin South Pasadena, California. 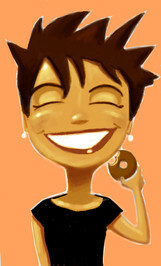 In her spare time, Lisa likes to read, make things out of junk, and consider taking a nap. Her HUGE collection of Winnie the-Poohs is on loan to the White River (Ontario) Winnie-the-Pooh Museum. With the publication of Millicent Min, Girl Genius, Lisa has realized her lifelong dream of becoming an author. The winner of the prestigious Sid Fleischman Humor Award, there are over 500,000 copies of MILLIE in print. Lisa's second novel, Stanford Wong Flunks Big-Time won the Chinese American Librarian Association Best Book of the Year award, and was named an American Library Association Notable Book. Lisa was also named the 2007 Thurber House Children's Author-in-Residence. Her third novel, So Totally Emily Ebers came out in 2007 and so did Good Luck, Ivy, an American Girl historical novel. In 2009, Lisa's first YA novel, Absolutely Maybe, debuted, as did Bobby vs. Girls (Accidentally), the first of her new chapter book series, which was followed up by Bobby the Brave (Sometimes) in 2010. 2011 marks two more American Girl books, Aloha, Kanani and Good Job, Kanani, plus Warp Speed, a spin-off of the Millicent Min Trilogy. Wonderful review. You raise a lot of really good points.